The MCC promotes spiritual growth for its members. Service without a spiritual grounding is in vain. Training includes instruction on church doctrines and history. Members are required to participate in activities to include, but are not limited to witnessing, evangelistic outreach, church involvement in a local church, and other spiritual growth building activities and training. The MCC works is a ministry of the World Service Organization/National Service Organization (WSO/NSO) and fall under the Adventist Chaplaincy Ministries Department of the Seventh-day Adventist Church. WSO/NSO works in collaboration with the Adventist Community Services Department of the Seventh-day Adventist Church, the American Red Cross, and other government relief and rescue agencies, such as FEMA in the United States. 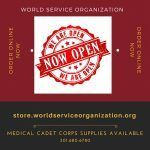 The Medical Cadet Corps paramedical training includes basic and advanced rescue training, cardiopulmonary resuscitation (CPR), disaster relief, and preventative health. A regimen of physical exercise promotes mental and physical discipline in the members.